I’m sure that some of you will be delighted to know that this is a walk where you can cheat hugely. 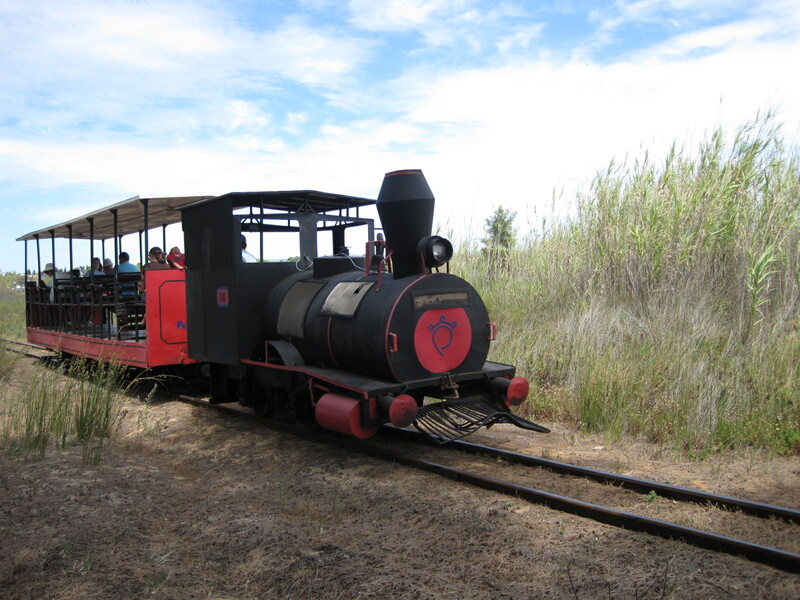 It’s definitely one to take the children along on, or maybe you have a husband who always wanted to be an engine driver? Look what runs alongside the footpath- too tempting! 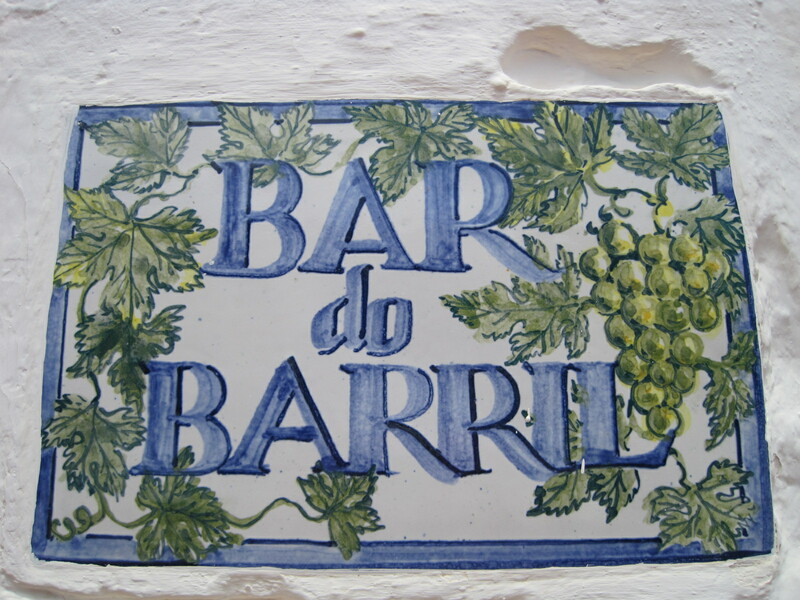 I can’t remember ever visiting the Eastern Algarve without a visit to Barril. Come along with me and I’ll try to show you why it’s such a favourite. 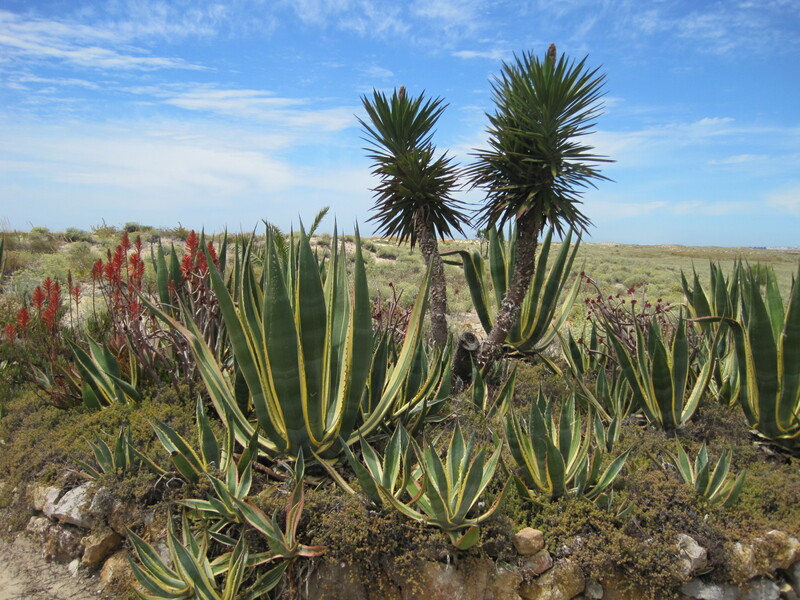 If the weather’s not too warm and you’re feeling fairly energetic, you can start in the nearby village of Santa Luzia and complete a circular walk. I’ll give you more details later. For now, we’ve tossed the coin and decided to do it the easy way, from Pedras d’el Rei. 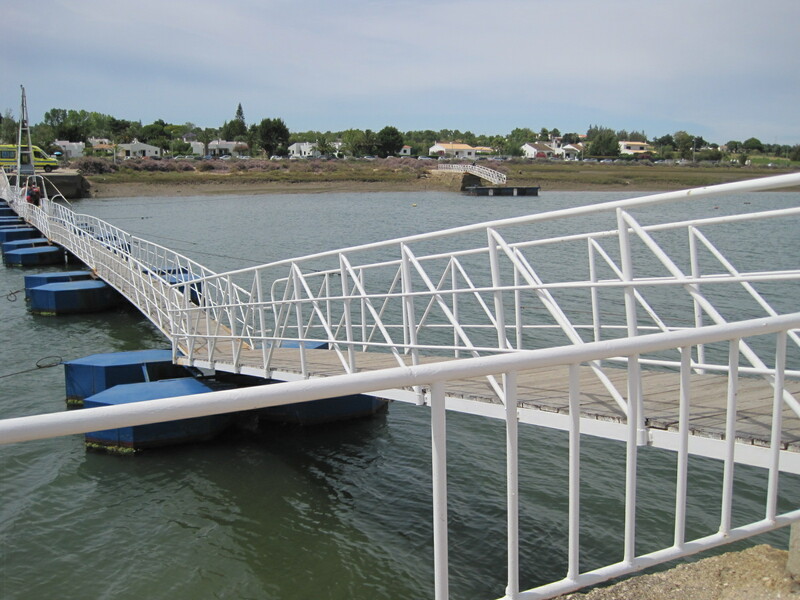 Your start point is beside the salt marshes and all you need to do is cross over the pontoon. There are distractions, of course. A box of ripe figs alongside the pontoon! I didn’t want to carry them with me on the outbound journey but I really hoped there might be a couple left on my return. One thing’s for certain- the sea broom will be your constant companion along the way. One of the big attractions for me is the variety of wild flowers you will find alongside the path. This one has tiny red ants crawling all over it! This one’s plain. It reminds me of broccoli! And the yellow guy again! I know this will be a challenge for my friend Jude. She loves to identify flowers. How about this one? 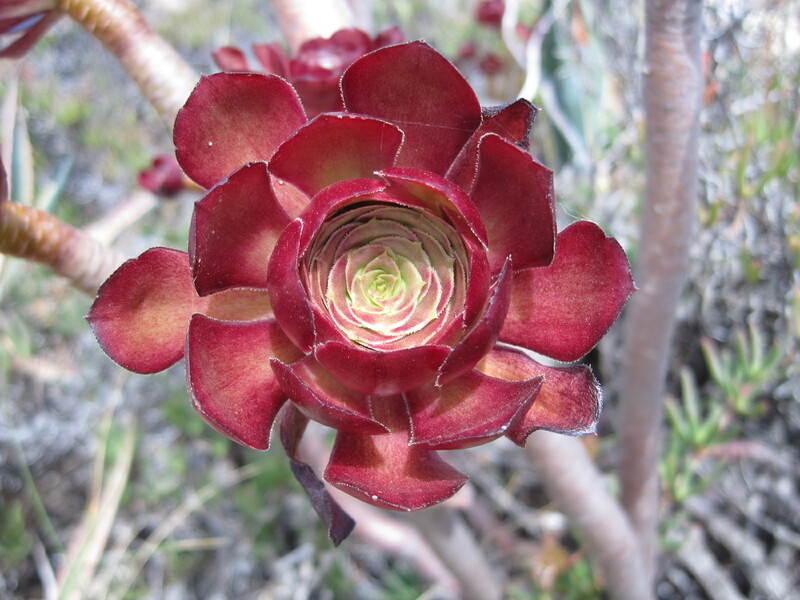 An Aeonium? As you approach the beach the flowers I have been calling Livingstone daisies, but I now find are Ice plants, appear in the dunes. 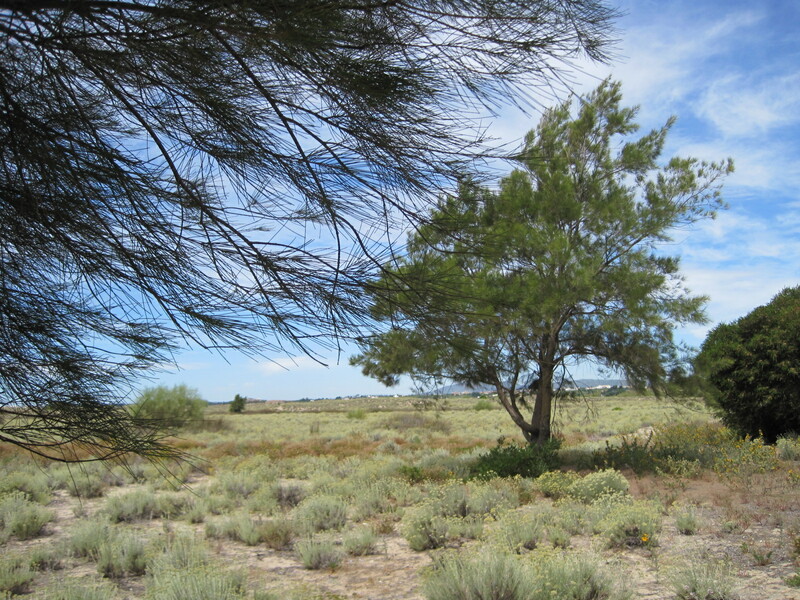 I featured a hot pink in my Six word Saturday, but in the Algarve they are more commonly lemon yellow. A little detour to the anchors, of course! They always capture the imagination. 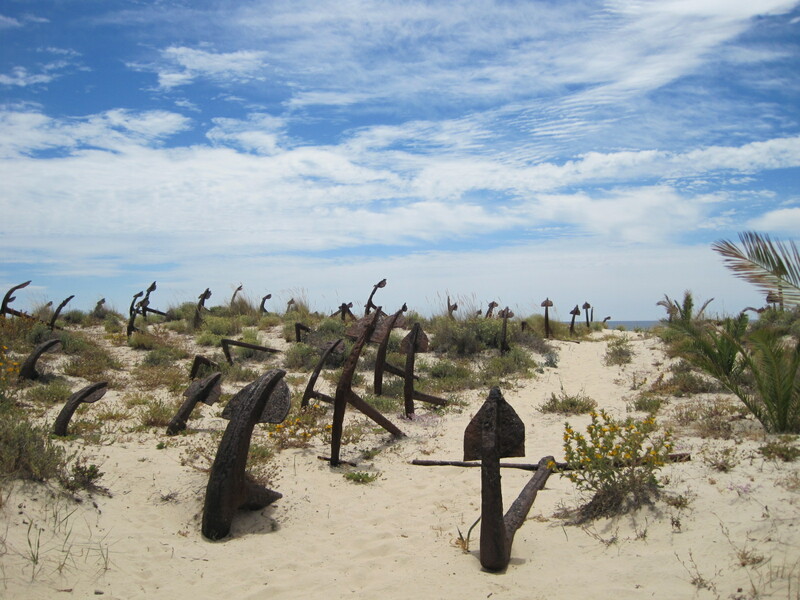 A reminder of the days when the tuna fishing industry thrived in this area, the rusting “Cemetery of Anchors” provides a wonderful photo opportunity. I would love to be there are sunset. Here you have a choice. 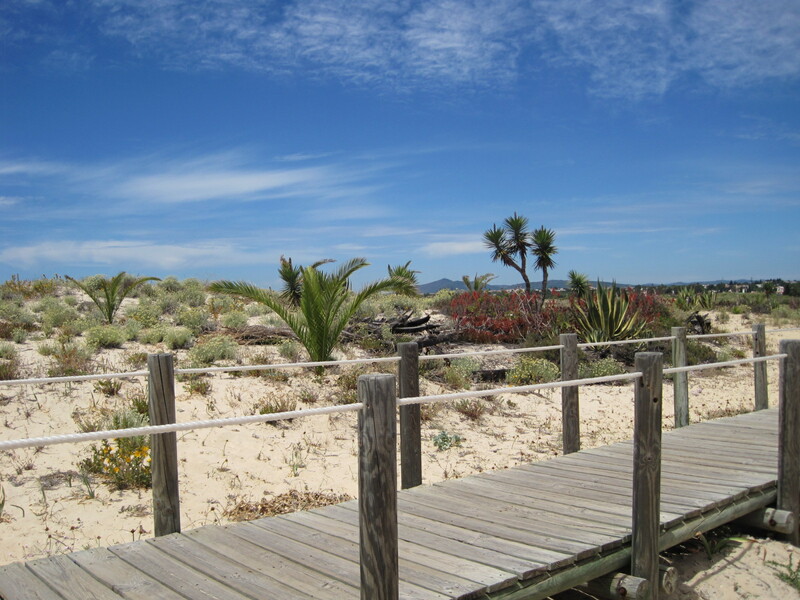 Remember I suggested a circular walk from Santa Luzia? If you turn left when you reach the beach, 20-30 minutes walk along it will bring you to a point opposite Santa Luzia, to which a ferry runs in Summer. Access is across a long boardwalk. My husband suggests that you should do this longer walk the other way around, starting with the ferry from Santa Luzia, to ensure that it is running. He is a very practical soul. But you and me are going back the way we came. I still have those figs to collect, remember? We might even cheat and take that train. It’s a holiday, after all! Who doesn’t love the age of steam? Crossing back over the pontoon, I’m not very surprised to find the ‘fig man’ gone. But then I spot him, coming towards me, wheeling his bike with fresh supplies on the saddle. He sees me too, and stops, the bike propped against his leg. ‘Help me, please’, he says, in smiling English, and invites me to take a plastic bag from under his arm. In doing so, I catch the edge of his cardboard box and the figs start to tip! We both lunge for them and manage to stop all but one from crashing to the floor. Phew! They are 5 for 1 euro, and he pops an extra one into my bag. Thankfully all his customers are not as ‘helpful’ as me. I haven’t even shown you the beach yet, but it’s a beauty. 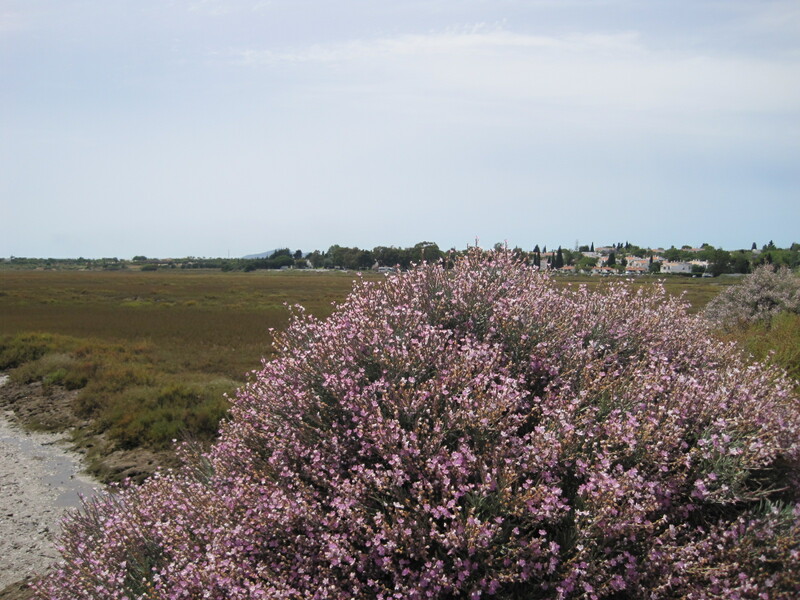 Barril is just a small area of Tavira Island, which starts at the mouth of the River Gilao and rolls westward. 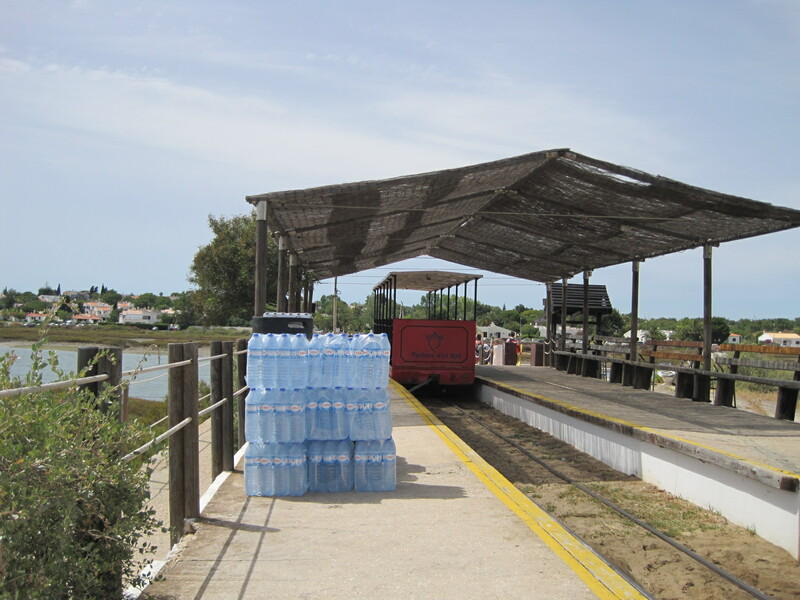 If you don’t have a car, a bus will take you from Tavira town centre to Santa Luzia, 15 minutes away, and continues on to Pedras d’el Rei, just a few minutes further west. I guess I have to show you the beach! Next week I think I might take you on the walk where I fell down a ‘hole’. Life’s seldom dull, is it? I think I should maybe design a ‘rules’ page for the walks, too. Not that there are any rules really, but then I wouldn’t have to bore you with the details each time. Please spend a little while visiting these walks. They give me an enormous amount of pleasure and I’m very grateful. Happy walking, one and all! Jo this was one of my favourite walks with you. I love the beach and all its beauties. 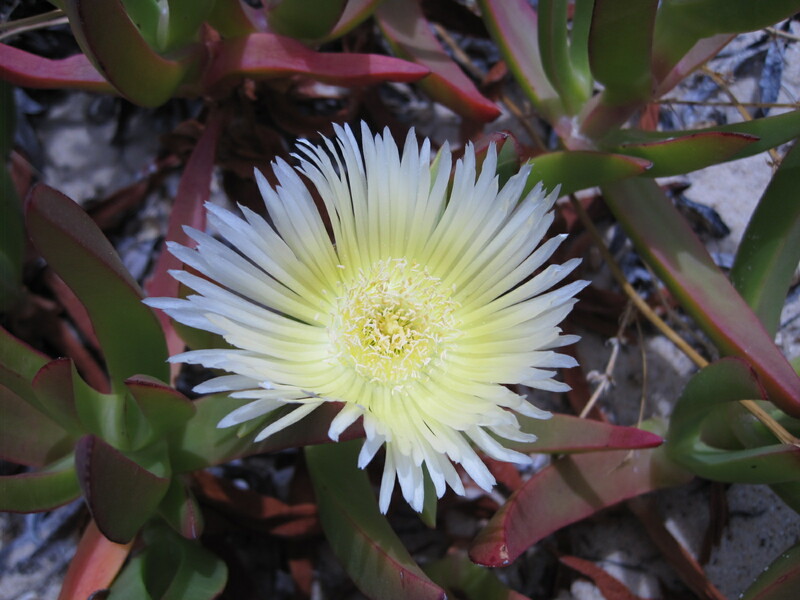 I adore ice plants…they are so intricate and yet sturdy. Glad to hear you got some figs at the end of your trip. Thanks, Jo 🙂 It’s one of my regular haunts when I’m in the Algarve. Sigh! What a lovely place. The first shot is so intriguing, with the anchors (?) in the sand. Makes you wonder about the story behind them. 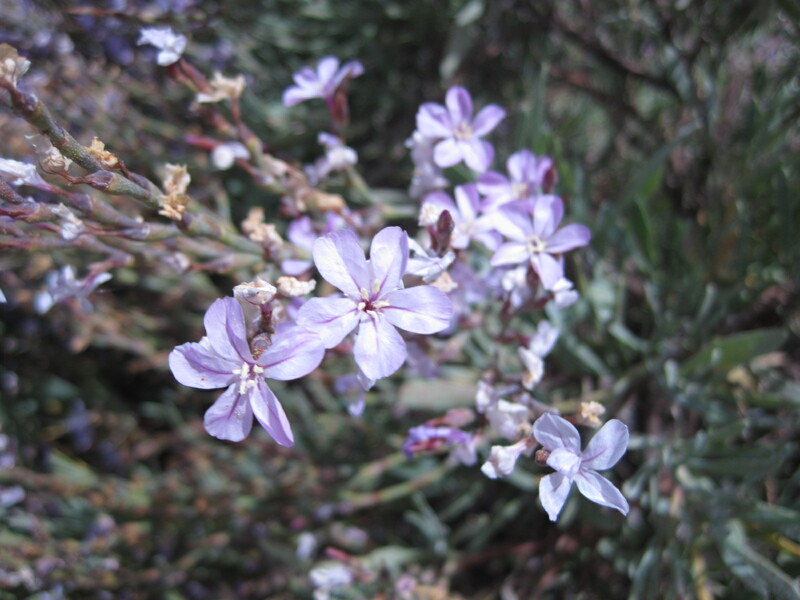 The ice plant is beautiful, though I’ll confess the wild flowers were my favourite… so bright and happy! Wonderful to be back in Algarve again with you! *smile – Ice flower, beautiful – never heard about before. Also you image of the Barril Beach is just top class – love that you are using it as a header. 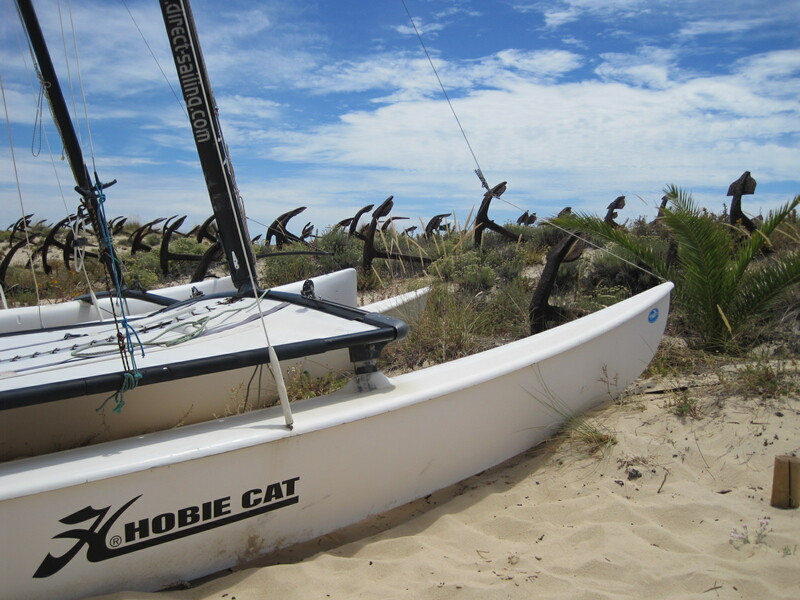 All the anchors – just love your image of it anyhow. I can image your walk took a lot longer when you capture all this beauty. So beautiful. Have to work on my beach images too .. from Skanör. I know you’re not really a beach person, Vivi, but I would love to see some images from Skanor. Jo, I love beaches very much – but not much for sunbathing. 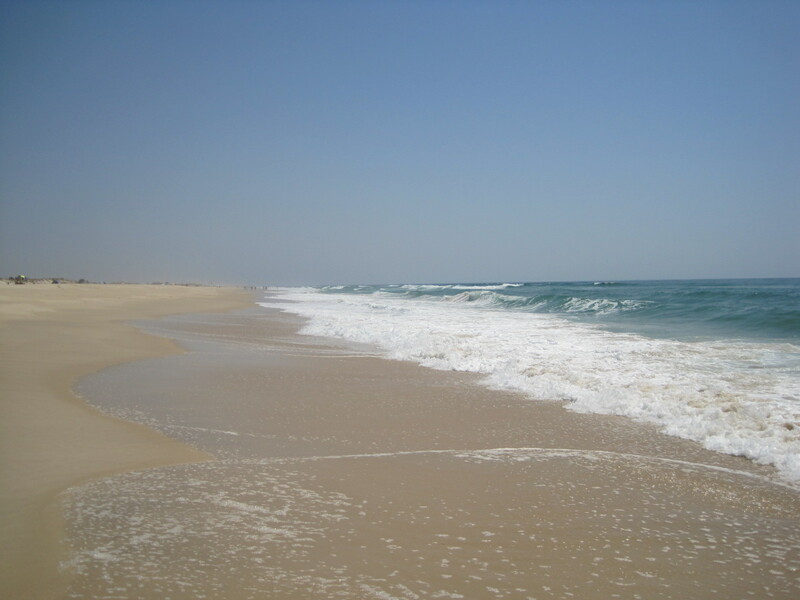 Love to walk along beach where ever they are. Brighton and Nice beaches are very tricky because of the pebbles. Sand love it, gives good exercise to the thighs too. The knee has kept me awake more or less the whole night – terrible and no lucky pills works. So strange that it doesn’t really bother me when I walk, can feel a little, but not as during the nights. I was looking at your Skanor last night- what a beauty! Toppling figs and toppling into holes; no shortage of adventures for you, Jo. Glad all was well so that we were able to get your post as usual. I am what is generally known as ‘accident prone’, Ann. When I disappeared into the hole my husband knew who’d fallen, even though he was nowhere near! It’s a wonder I’m still in one piece 🙂 But I flounder on! The landscape is so beautiful and complex, Jo, I understand why it’s a favorite of yours. 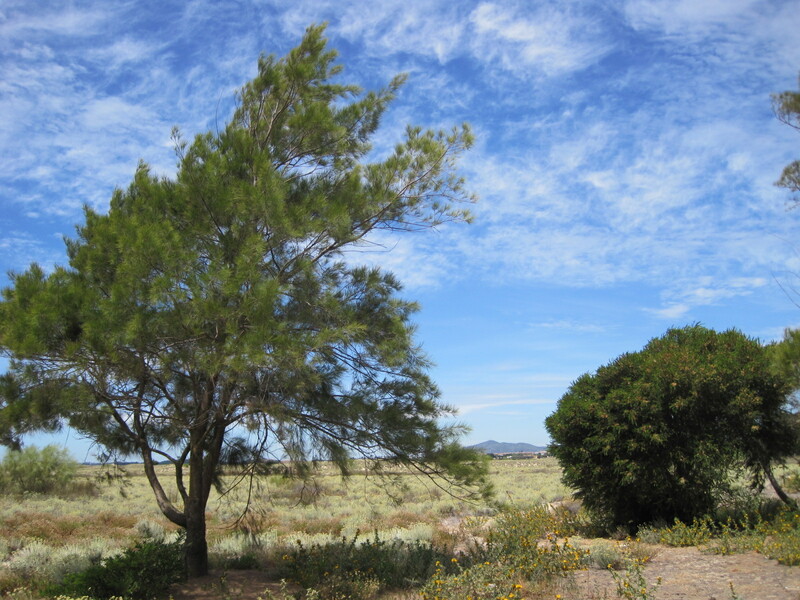 I love the photographs of the windswept evergreens with the Monchique in the background. I love any walk that ends at the beach. The sand looks like the smooth powdery kind. This is the perfect combination of attractive flora and charming vistas. Thanks for taking us along on your walk. The smooth powdery kind it is, Jackie 🙂 An ageing beach bum like me really loves them. A lovely walk to enjoy on a lazy Warsaw morning. 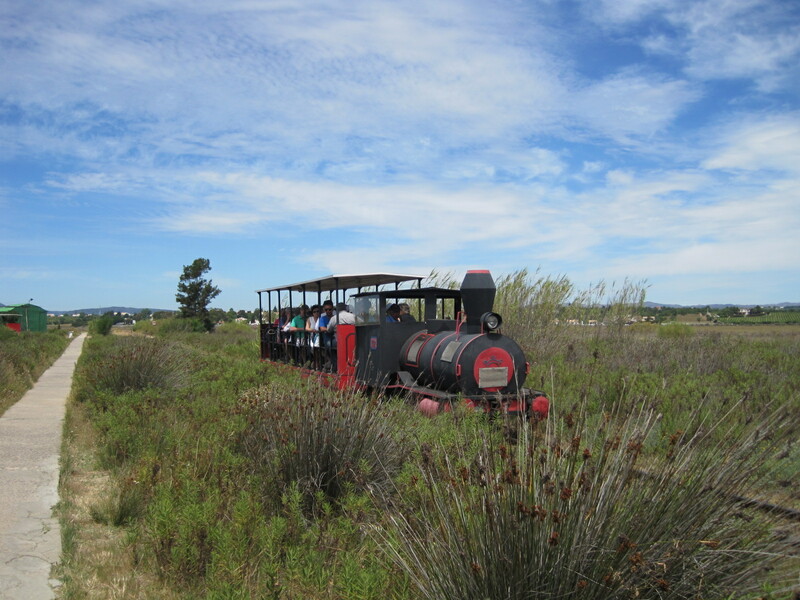 I particularly liked the first shot of the train puttering through the grasses; the angle of your shot of the pontoon; the sweep of petals on the ice plant; the soft-hardness of the Aeonium; those lovely clouds; and the beach – am I beach-hungry maybe? The age of steam has many attractions: for me the splendid stations glorifying its genesis in Prague and Zagreb, reminding me that many Australian stations have heritage value too, and are grander than the towns they now serve. Morning, Meg 🙂 I’ve been ignoring my blog and trying to hunt down a good deal to Paris for our Silver Wedding this morning. I’ve abandoned the effort because it’s more than I want to pay. Blue skies are a thing of the past 😦 Breakfast calls and then my t’ai chi class.